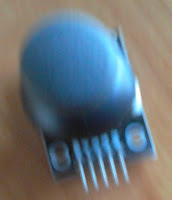 Expected that it would be very easy to test this sensor with the script below as i wanted to use it also for an Arduino project with a servo. Result: X an Y functioned correct Push button gave problems. Result: Key push not function on my joystick !! Tried the KY-023 script below with this other KY-023 module. Result: X Y functioned . 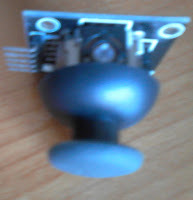 Button works better but still gives some problems: If pressed signal is 0. If not pressed, most times signal is 1 but some noise on line gives sometimes signals 0. On the joystick module a debounce resistor is not on the module and it is needed for some applications. There is a location for an SMD resistor on the PCB. Better de-bounce is needed!